I was a reluctant adopter of social media, and have in fact given presentations entitled ‘the sceptic’s guide to Twitter’. Since sending my first tweet in 2014 (https://twitter.com/history2wheeler), however, I’ve come to appreciate the platform’s value in sharing information, building networks and serendipitously encountering all manner of unexpected content. Over the past week, however, I have also experienced Twitter’s extraordinary power in mobilising a worldwide community around at-risk heritage. Just a week ago I received an email from the Australian Society for the History of Engineering and Technology (ASHET). It shared the sad fate of the Australian Computer Museum Society, a small group comprised primarily of former programmers and engineers who have gathered a wealth of computing artefacts. These range from late 1950s storage media to 1960s and 1970s mainframe ‘minicomputers’, through to punched cards, desktop consoles and the revolutionary ‘personal computers’ of the early 1980s such as the Microbee and Commodore 64. Along with the devices, circuits and peripherals, they also collected documentation, manuals and trade magazines, all with the aim of creating a computing museum that has never come to fruition. The ASHET email outlined the society’s dilemma: the storage facility in which the collection resided would be bulldozed in two weeks and they had nowhere else to go. 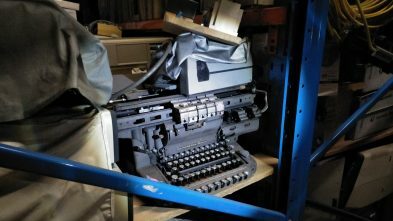 For the coming fortnight, the society’s Treasurer announced, their Villawood warehouse would be “open for anyone who cares to come and take anything away and help preserve our computing heritage”. In short, they would rather give it away than see it destroyed, even though it meant dispersing the (uncatalogued) collection forever. I visited Villawood the next day and found several poorly lit rooms crammed high with ageing equipment and tired but friendly volunteers. Station wagons and vans were coming and going as enthusiasts and collectors stopped by to admire, fossick and depart with whatever took their fancy. Computing history isn’t my speciality so I relied on the volunteers to explain the function and value of various items, including a substantial 1960s minicomputer that had once held an important place in the School of Physics at the University of Sydney. Despite my enthusiasm and willingness to urgently document its role and significance, it sadly didn’t fit my own institution’s collecting policy. What I did do, though, was photograph a selection of items and some wider vistas of the collection and posted them on Twitter that Saturday afternoon. Since then the response has been phenomenal. One tweet in particular has already attracted 88 likes, 24 replies and 193 retweets. Within a day I was being contacted by a programming guru in California and the Computer History Museum in the same state. I’ve since had direct messages and emails from curators, collectors, enthusiasts and IT folks from Britain, Sweden and around Australia. Several have tens of thousands of Twitter followers or hundreds of thousands of YouTube subscribers. There have been offers to set up a GoFundMe rescue fund to pay for emergency storage, while many locals have offered garage, warehouse and shipping container space. I’ve put all of them in touch with the volunteers, and also dropped a line to local archives and libraries in case they wanted to rescue any technology to enhance their own digital preservation setup. Even finding a useable 5¼ inch floppy disk drive is hard work these days! I’m sad to see the collection being picked over and dispersed; it will clearly never form the basis for a museum. However, I’ve also been heartened by some of the stories, particularly an 18-year-old enthusiast and his 20-year-old boss from Kiama, who drove up in a truck and saved a suite of rare minicomputers which they hope to restore to working order. It may mean that some of these devices – and their rapidly dying programming languages – will survive a little longer. While not an ideal outcome, the transformation of a simple tweet into practical action has been truly inspiring. Great work all round. Small museums really do survive on the smell of an oily rag, and lots and lots of TLC. Peter superman Hobbins! Harnessing the power of social media for good. Now we just need to convince the world, or at least the people who control the purse strings of the world of the value of heritage and museums.